The Island Affair: Can one summer mend a broken heart? The first book in a new series, The Island Affair, follows Alicia and Liam on their annual holiday to the Åland Islands. This was a great read and one that I could really get stuck into. Its about life, love and loss. It is written in third person and the plot is very much created by the characters and how they deal with a variety of situations. This is a book that has to be read and so there will be no plot giveaways here. It is brilliantly written with a captivating location and great in-depth understanding of people’s emotions to what the characters face. The Island Affair is the type of contemporary romance/drama that I am enjoying far more these days than the light and fluffy reads. It has substance. 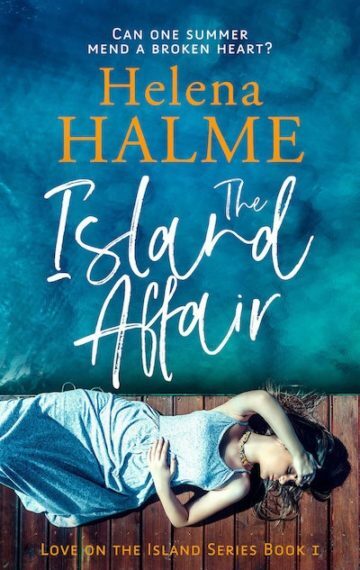 The Island Affair by Helena Halme deals with some tough themes of grief, loss, betrayal, martial affairs – but it isn’t a sad story. It is a story about life. The writing is good, the pacing suited the story and I fell head over heels in love with the setting. The book takes you to the beautiful Åland islands, somewhere I would love to now visit someday. It is atmospheric. It is beautifully described. I enjoyed the family dynamics not only between Alicia and Liam, but also the complex mother – daughter relationship between Alicia and Hilda. This is a novel jam packed with interesting characters. And the author did a fantastic job of making sure they all stood out. I could have happily spent longer in their company. The book doesn’t quite wrap everything up neatly, but then that is to be expected in the first of a series. I was happy with the ending, though. I also very much enjoyed the underlying criminal aspect of some of the characters behaviours, something that I imagine might be explored in further books. Now I must wait, somewhat patiently, until the next book is available. And isn’t it a beautiful cover? Halme captures the way the death of their young son destroys the relationship and marriage of Alicia and Liam. Neither of them are willing to accept how the other is dealing with the tragedy. They come to a crossroads and decide to go their separate ways, which is where the tale really begins. Alicia finds common ground and a flirty romantic connection with Patrick. The helpful and willing listener helps her to come to terms with the loss of her son. The Nordic atmosphere and stoic attitude of the townspeople gives the story a quirky charm. There is an underlying tension of a thriller that flows through this hotbed of emotional turmoil, which isn’t an easy feat considering the pain that hovers around the main characters. A descriptive and vivid tale about the beautiful and intelligent, Alicia, and how her life as she knows it becomes flipped upside down by an intoxicating man that is like none she has ever met before. Unable to deny their obvious magnetism, and her desperate concern for his secrets to be revealed, this story is chock-full of mystery, secrets and passion. Alicia feels surprised and somewhat honored, in a way, that Patrick does divulge himself to her. They intensely share a mutual and sympathetic accepting of each other’s downfalls, and past stories of life’s inevitable heartaches. Patrick is someone who understands, and someone who she finds a new kind of love with. Such a wonderful feeling to have such strong and reciprocated trust in any relationship, and also so important, which is why the story of The Island Affair could be perceived as a relatable scenario for its readers. With a keen ability to giving her readers an identifiable perception of her characters, I felt thoroughly engaged with each personality I encountered, fully with every turn of the page. I enjoyed the individuality of the spirited protagonist and her admirable depth. Author, Helena Halme does an excellent job giving her readers a perfect portrayal of such beautiful wonder when describing the breathtaking views and scenery of Alicia’s surroundings. While, enthusiastically devouring, The Island Affair, I felt completely enthralled by such dazzling backdrops, which is written in an enticing and steamy way of expressing the seductive island terrain. Read this new family drama set in one of the most captivating holiday islands in Scandinavia today! Would you like to find out how Alicia and Liam’s story began? The Day We Met, a prequel to The Island Affair is free and only available to my Readers’ Group. Just tap here to read it now.